How will the teams on site raise components weighing up to 450 tonnes from their horizontal delivery configurations to the upright orientation needed for assembly? With a specially crafted "upending" tool that will provide support and safeguards as the loads are lifted by crane and slowly tilted to vertical in mid-air. This bespoke tool produced in Korea is designed to raise ITER's largest components from their horizontal delivery positions to the vertical orientation required for assembly. In 2019, the massive doors of the Assembly Hall will open to admit the first of nine ITER vacuum vessel sectors. Encased in packaging and resting on a large transport frame, the 440-tonne steel component will resemble a sleeping giant ... one that has to wake, shake off its covers and stand upright before pre-assembly activities can begin. A lifting accessory procured by the Korean Domestic Agency will have an important role to play in the process. Termed the "upending tool," it has been designed for the 9 vacuum vessel sectors as well as another set of large components that must be lifted to vertical: the 18 large D-shaped toroidal field coils. The tilt operation is designed to take place several metres overhead, although the exact height will only be determined once tests are run on the assembled tool at ITER. The tool will clamp each component firmly at strategic interface points, keep it steady as the double overhead crane lifts both component and tool several metres off the floor, and finally disengage after the components have been brought to vertical. "Not counting the test lifts, the tool will perform the upending operation 27 times during ITER assembly," says Hyung Yeol Yang, Assembly Support Section leader. "Each operation will take up to three weeks—only one day for the upending itself, but several weeks—at least for the first few sequences—to prepare the loads and the overhead cranes so that everything goes smoothly." The loads will be suspended several metres above the ground as one side of the upending tool is winched to vertical. The tool will then be lowered and secured as the vacuum vessel sector (left) or the toroidal field coil (right) is lifted up and away to be delivered for pre-assembly activities. 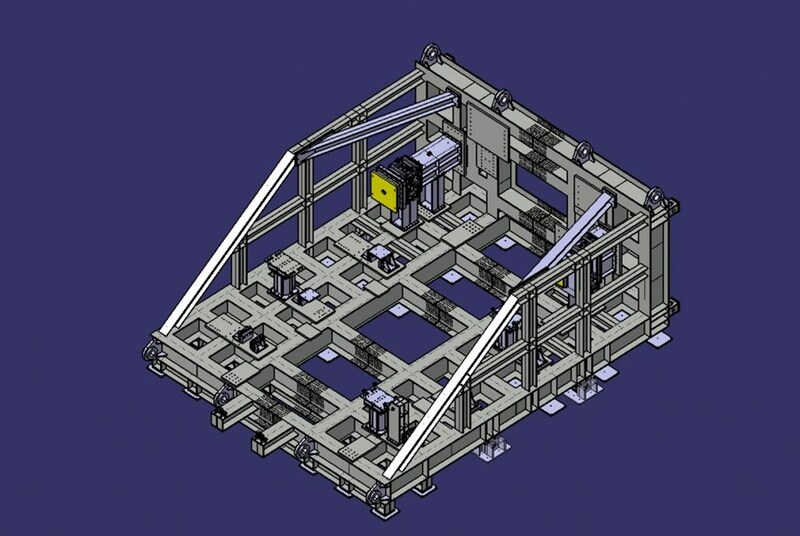 In Korea, the design team has now completed the structural integrity assessment of the main frame, its footings and the interfaces planned for the two types of load it will carry. Following the submission of the model to the ITER Organization last week, teams are now finalizing the 2D drawings needed for the start of fabrication. Korean contractor ILJIN plans to deliver the tool to ITER in two sections in March 2019. 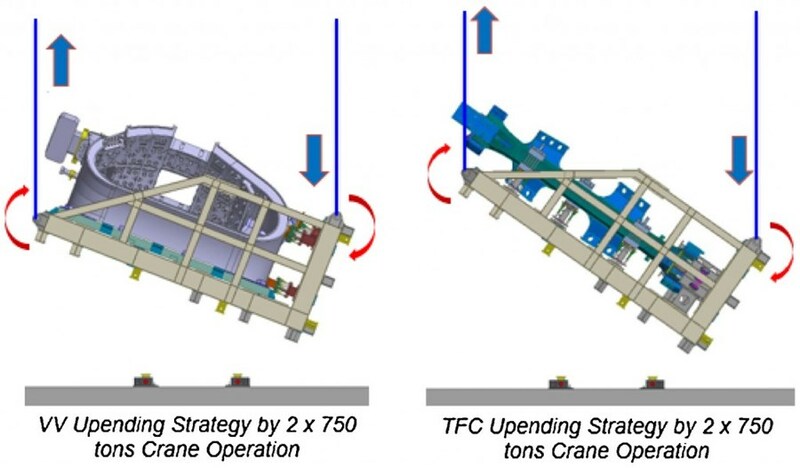 In parallel, the ITER Organization will be placing a contract to first assemble and then test the tool using the test loads planned for use on the first sector sub-assembly tools. In one year, the first upending operation should be underway. ¹ The "upended" components will be delivered to one of the two sector sub-assembly tools, where each of the vacuum vessel sectors will associated with thermal shields and a pair of toroidal field coils before being delivered to the machine assembly area.